The Faculty of Rehabilitation was established in April 2005 with the basic philosophy of working to achieve "community-oriented rehabilitation." The faculty consists of the Department of Physical Therapy for the training of physical therapists, the Department of Occupational Therapy for the training of occupational therapists and the Department of Social Rehabilitation for the training of certified social workers and psychiatric social workers and the nurturing of members of society with a welfare-oriented mind. 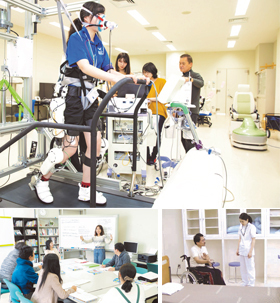 Very few universities in Japan provide such training of rehabilitation specialists and the departments are attracting much attention. 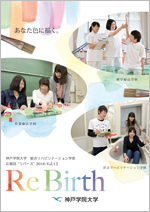 In April 2009, the Graduate School of Rehabilitation was established. Four Years to Develop Comprehensive Skills and a Multifaceted Perspective. As the fields of rehabilitation and social services grow increasingly complex and diverse, assistance providers must have broad-based training and be able to respond with flexibility. We develop experts who have more than just specialized skills and expertise, but also a multifaceted perspective and thinking skills that take into account the big picture. A curriculum with organic coordination between the three Departments. The curriculum prepared includes common subjects and practice implemented jointly by the different departments. As students from the three departments work together on the same problems, they learn the value of the teamwork that will serve them well in the real world at the same time as acquiring the ability to deal with problems and gaining practical capabilities. A Dedicated Facility with Cutting-Edge Equipment. The university built a seven-story building to coincide with the opening of the Faculty of Rehabilitation. As a rehabilitation-related university facility, it offers size and equipment that exceeds all others domestically. With a diverse variety of specialized practical training rooms not found at any other university, our efforts are focused on student learning by doing. Qualification for national license examination of physical therapist can be acquired at the time students graduate. Qualification for certification exam of Health/fitness trainer certification by examination will also be aquired with credits in the designated subjects. Our primary goal is to train physical therapists, but the core of the program is more than simply enabling the acquisition of certification. We want students to develop their capacity to provide home rehabilitation and handle other needs that may arise in society, as well as research capabilities and the leadership qualities needed for team treatment in the real world. Upon graduation, students are qualified to take the national examination for occupational therapist. We strive to develop the students with the practical capability to rapidly treat with each individual case in various fields, including medical facilities, social welfare and public health facilities, and home care, regardless of patient age or handicap. Based on to provide social support to all people in need students organically learn both theory and practice to acquire from capabilities as social welfare professionals to knowledge, skills, and technique for assistance with living, enabled by the resources of the Faculty of Rehabilitation. On the social worker course, when the required number of credits designated by Ministry of Health, Labour and Welfare is earned, upon graduation, students are qualified to take the national examination to become a certified social worker or psychiatric social worker. The Social welfare design course nurtures human resources who have a welfare-oriented mind and can be active in a wide range of situations in society and in companies. Students and faculty members work with local neighborhood associations, administrative organizations, specialized institutions, NPOs, and residents’ activity groups to organize seminars, consultation services, and festivals. At present, students of the Department of Social Rehabilitation are visiting there on an ongoing basis as part of on-the-job training and group activities. In recent years, accomplishments in the field of Robotics have been applied in the fields of medical care and welfare. In Department of physical therapy, the Robot Suit HAL has been introduced, and seminar students are encouraged to consider applications for new technologies that assist walking functions lost due to diseases and disabilities.